This half-day symposium for nurses, respiratory therapists, healthcare professionals, student and lay persons will open with information on the Pulmonary Fibrosis Foundation Registry. 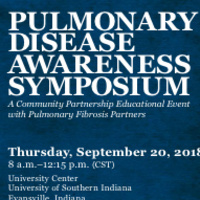 The symposium will provide an overview of innovations in pulmonary disease diagnosis and management including pulmonary fibrosis (PF), lung cancer, lung transplantation and pharmaceutical considerations. The learning outcome of the program is for the attendee to be able to implement effective strategies in the effective care and management of persons with respiratory illness.